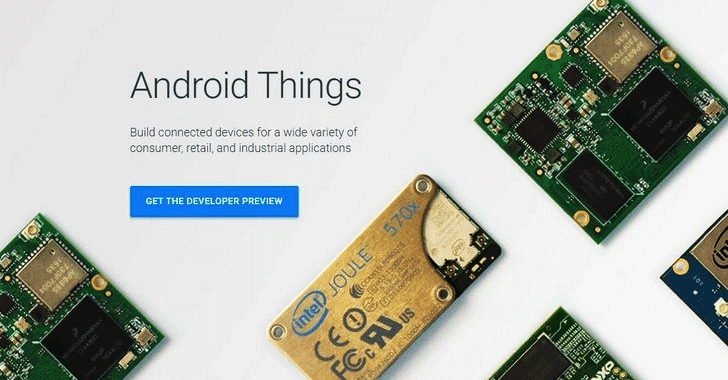 Google announced a Developers Preview of "Android Things" — an Android-based operating system platform for smart devices and Internet of Things (IoT) products. The Android-based Internet of Things OS is designed to make it easier for developers to build a smart appliance since they will be able to work with Android APIs and Google Services they're already familiar with. As the Developers page of Android Things says: "If you can build an app, you can build a device." The Android-based Internet of Things operating system is supposed to run on products like security cameras, connected speakers, and routers. Android Things is a rebranded version Google Brillo, an Android-based IoT OS that Google announced in 2015, with added tools like Android Studio, the Android Software Development Kit (SDK), Google Play Services, and Google Cloud Platform. Unlike Brillo, development on Android Things can be achieved with "the same developer tools as standard Android." While Android Things supports a subset of the original Android SDK, Application Programing Interfaces (APIs) that require user input or login credentials like AdMob, Maps, Search, and Sign-In are not supported. Just like Android smartphones' OTA update mechanism, developers can push Google-provided operating system upgrades and custom application updates using the same OTA infrastructure that the company uses for its products and services. Google will soon be adding support for Weave – Google's IoT communications protocol that helps devices connect to Google Cloud services for setup and to communicate to other gadgets. Weave Server will handle device registration, storing of states, command propagation, and integration with Google services such as Google Assistant. For local and remote communication, Weave SDK will be embedded in the devices. At this moment, Weave SDK supports schemas for light bulbs, thermostats, and smart plugs and switches, with more device types coming soon. According to Google, SmartThings and Hue are already using Weave protocol to connect to the Google Assistant, while "Belkin WeMo, LiFX, Honeywell, Wink, TP-Link, First Alert, and more" are also working on adopting Weave. Google's developer preview of the IoT OS is offering support for the Intel Edison, NXP Pico, and Raspberry Pi 3, so developers can build products using these hardware development kits. Additional certified devices will soon be added by the general availability of Android Things. You can get started with the Android Things, which is currently in Developer Preview.